Last edited by Revenant on Thu Oct 18, 2018 7:22 am, edited 1 time in total. What's that in practical terms? Someone with a Satellaview can hook up a CF card, and have their game contain 128 GB of data? Cool, that does in fact look very similar - and it does explain why they came up with two chip selects instead of using a fourth address line. 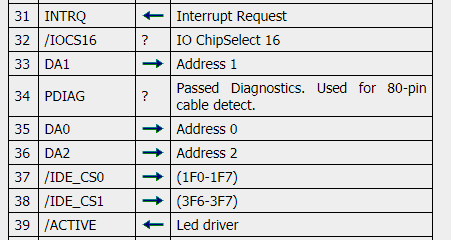 Hmmm, I was always thinking that PC's did have some sort of "HDD controller", but looking at the pinout, it does more seem as if they did only have some "address decoder" and did merely forward the chipselects to the actual controller in the drive. Do you have some info which drives support 8bit transfers, up to which capacity, from which era? As far as I remember somebody made a homebrew adaptor for connecting 16bit-only drives to 8bit computers using a dirty trick: It's simply leaving each second byte unused, so you get only half of the drive capacity. The advantage is that it should work with all 40pin/parallel drives, and even halved capacity should be huge for SNES standards. The downside is that one couldn't swap the drive between 8bit and 16bit computers because they'd either see each 2nd byte missing, or see garbage bytes inserted between each byte. No idea about specific drives, unfortunately. It might be safe to assume that most IDE drives made during the lifespan of the Satellaview (or at least the earlier years) could be usable in 8bit mode. The CF spec requires that all compliant cards support 8-bit transfers in True-IDE mode using Set Features as you discovered. So you are guaranteed this will work for all CF cards. As the HDD interface is mainly consisting of an address decoder, one won't even need the BSX base unit for that, one could as well built some small circuit that decodes 21Axh, and wire it to the SNES mainboard, expansion port, or cartridge slot. Extravagant homebrew... how about porting the unreleased Super CD BIOS to load unreleased CD games from the unreleased HDD interface instead of from the unreleased CDROM interface. And of course, for the best of best extravagancy: after finishing that homebrew project - keep it unreleased! "Nintendo, for example, showed the Kittyhawk team an entertainment system they had already designed, unbeknownst to HP, with a slot for a Kittyhawk drive to be plugged in—a module that could contain many more games, with much more sophisticated graphics, than Nintendo’s conventional cartridge approach. ‘The system is all set,’ the Nintendo representative persuaded. ‘All you have to do is sell us your drive for $50.’ When White protested that the Kittyhawk’s accelerometer alone (required for shock resistance) rendered the $50 price impossible, Nintendo responded that they did not need the accelerometer— they just needed 20 megabytes at $50, cheap and simple." Citation: Clayton M. Christensen. (2006). Hewlett-Packard: The Flight of the Kittyhawk (A). HBS No. 606-088. Boston, MA: Harvard Business School Publishing. In reference to the HP Kittyhawk hard drive. This hard drive was introduced in 1992, plausible that this is what was intended for the Satellaview. For some context, the quote is from a case study on the HP Kittyhawk hard drive project from a business standpoint. The study did mention that Nintendo was a potential customer and showed interest in the hard drive after the idea of a miniature mass storage device was pitched to Nintendo marketing manager at a trade show. What 'system' the quote mentions can be up for interpretation but I am placing bets on the Satellaview. Out of curiosity, I found a Dauphin DTR-1 tablet - an old portable touch screen MS-DOS tablet produced around 1993. It has a Kittyhawk hard drive in it. I purchased to see how the drive would fit. Comparison of the Kittyhawk drive next to 0.01CAD inside of the Satellaview EXT bay. Plenty of room to build a plastic enclosure around this and fit an adapter to connect the hard drive to EXT port. I have a Microdrive or two somewhere, larger IBM models IIRC, a GB or few. They come in the CF form factor, with a CF connector. Early iPods used those. Pretty interesting find about the Kittyhawk drives. A small form factor drive like that would have made sense for a console peripheral, but it sure is small for the amount of space in the actual bay. I started prototyping a CF adapter board just for fun earlier this week, I might post the KiCad files / some example software to read the card whenever I start writing the latter (probably sometime next week). Well DaveyPocket got ahold of a BS Encoder (Kenwood BS-3600), and it generates BS signals from back then, and guess what? It works on the Satellaview hardware! This will be super helpful. Hoping to find some documentation on the device actually. Uh, what is that "Kenwood BS-3600"? It looks like a beep-generator with train-station-sized LED display... or does it have some slightly more useful features like converting incoming analog or digital audio to digital BS format? And what was that thing good for, was it for broadcast stations, or was it some sort must-have daily madness home wifi equipment? Anyways, it's a pretty good finding for testing the satellaview hardware. The BS-3600 is capable of encoding video and digital audio to the standards compatible with BS decoder set-top boxes. There is a built-in function generator to test the audio channels. It has the capability of accepting external audio input from an external analog-to-digital converter (which I do not have). It might be capable of encoding auxiliary data but I am unaware as I do not own documentation for this device. The BS-3600 seems to be intended for manufacturing/repair/testing of BS-related equipment, definitely not intended for the consumer market.